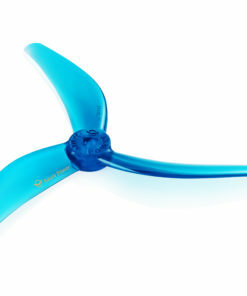 The Emax Avan Flow propeller 5×4.3×3 was designed to maximize control while remaining efficient. A true constant 4.3″ pitch throughout the blade gives a linear control feeling across the throttle band while still achieving high speeds. With a special PC blend the Avan Flow weighs 4.3 grams. Most of the weight is centralized near the hub creating a low moment of inertia of 13.4 grams*square centimeter which in turn makes a very responsive prop. Best match for 2206-2207-2306 motors around 2400kv. Good grip and feel, bendy so they don’t snap but they do seem to bend out of shape easily, to be expected when you look at how thin they are, can be bent back into shape. Good props for the price and came with some stickers aswell. Love these props. Great mid range and great punch out with these. More durable than other props I’ve used.